Nikolay Toivonen and Arabinda Mitra. Officials and scientists from Russia and India examined ways to raise levels of collaboration among them during the eighth session of the Russian-Indian Working Group on Science and Technology, held on September 3 in Moscow. Russian-Indian cooperation in the scientific field dates back over decades but particularly rapid development of relations in this sphere has happened over the last year. Important milestones were the signing of an agreement to establish the Russian-Indian Association of Universities, and an announcement by the Russian Science Foundation (RSF) and the Indian Ministry of Science and Technology to jointly sponsor an international team competition in the field of scientific research. 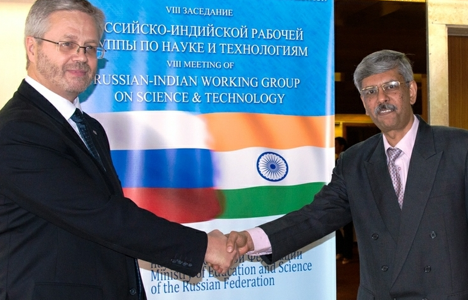 During the eighth session of the Russian-Indian Working Group on Science and Technology, held on September 3 in Moscow, representatives from both countries examined ways to further develop their cooperation. Nikolay Toivonen, head of the Russian delegation and director of the International Department of the Ministry of Education and Science, emphasized the successes achieved in the development of intergovernmental cooperation. The Ministry of Education and Science has already implemented six joint projects with the Indian Department of Science and Technology (DST) and five with the Department of Biotechnology. In addition, the Russian Foundation for Basic Research (RFBR) and the Indian DST have initiated a cooperation programme, which provides support to basic research projects. On September 21, the RSF and the Indian Ministry of Science and Technology plan to announce a jointly sponsored international team competition in the field of scientific research. This competition will be co-financed by grants; 4.6 million rubles from the RSF and up to 6 million rupees by the DST, annually. “I would also like to point out that next year we will be celebrating the tenth anniversary of our cooperation. Moreover, this year we have decided to expand our cooperation by increasing the number of supported projects – from 25 to 50,” said Toivonen. Toivonen also noted the rapid development of various institutions providing funding for scientific research, stressing that today in Russia they are working on developing an infrastructure to ensure that this system continues. “We are paying great attention to ensure that institutions wisely harmonize their activities, in order that work continues on projects that were already started and developed during previous stages,” he explained, adding that research and development projects should be supported up to the point of their final implementation by the industrial sector. Arabinda Mitra, head of the Indian delegation and manager of the DST’s International Division, noted that in India also, work is on to integrate scientific research with industrial production. Both sides agreed that in organizing bilateral cooperation in the scientific field, they should work to involve not only representatives of various interested government agencies, but also financing organizations. It was acknowledged that some difficulties existed in the process of joint collaboration work, such as ensuring parity in financing of projects. In this regard, Dmitry Korotkov, representative of the Science and Technology Department of the Ministry of Education and Science, talked about the Russian-Indian Council of Scientific Funds, in which not only the leading funders who that finance scientific research in Russia and India will participate, but also interested private business enterprises. Indian colleagues supported this Russian initiative. Similar projects have been developed within the framework of the BRICS. However, as Korotkov stressed, a bilateral organization will be easier to build, and it is very likely that a Russian-Indian council can implement work faster. The first meeting of such funders could take place in early 2016. Separately, representatives of both sides noted that India’s decision to join the Shanghai Cooperation Organization (SCO) would open up new possibilities in the field of scientific and technical cooperation. The decision on India becoming a full member of the SCO was made at the SCO summit in July 2015 in Ufa. In addition to financing, at the meeting they also discussed the organization of scientific work, for example, the allocation of priorities. Participants noted that in order to achieve better results, they should increase the number of contacts between representatives of both working groups, as well as between the research teams. Delegates agreed that various approaches should be used, from the organization of webinars on specific topics to motivational programmes for workers and educational trips for scientists and students. These initiatives will be further developed within the framework of the Russian-Indian Association of Universities. First published in Russian in S&T RF.